This book presents a modern version of the old Labor (or Natural Rights) Theory of Property and of an Inalienable Rights Theory that descends from the Reformation and Enlightenment. Together these theories re-solve the basic problem of distribution in the sense of giving a basis for the just appropriation of property and a basis for answering the question of who is to be the firm, e.g., the suppliers of share capital as in conventional capital, the government as in socialism, or the people who work in the firm as in the system of economic democracy (or labor-managed market economies). 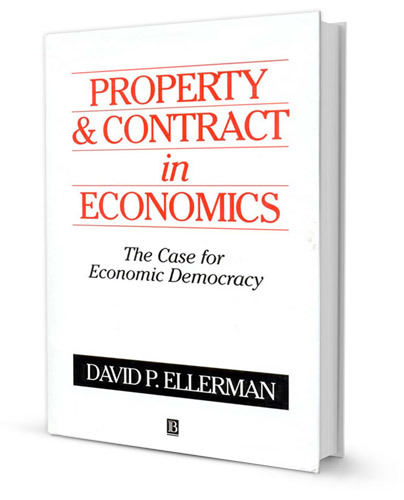 While these theories address old questions in economics, they do so in an entirely different manner than conventional economics which renders the questions as being about value or price theory (instead of about property rights and contracts). This book is now out of print and the rights have reverted to the author. The following description of the book is excerpted from a pre-publication review by the late Professor Don Lavoie of the Economics Department of George Mason University.